We often joke about the feeling of constant gray and dreary days in Bavaria. But when the sun pops it’s head out, this corner of Germany shines bright, both in actual sunshine as well as in things to do. A local favorite day trip for many is to wander the cobble-stoned streets of picture perfect Regensburg. However, a few sites nearby that beautiful town make for the perfect excursions either from Regensburg or a peaceful day in and of itself. Just thirty minutes away from Regensburg is the town of Kelheim. There isn’t a ton to do here besides the Hall of Liberation (a monument glorifying Germany’s victories against Napoleon) which is worthwhile if you have the time, skippable if you don’t. The views out over the valley below can be worth it though even on the quickest of stops. 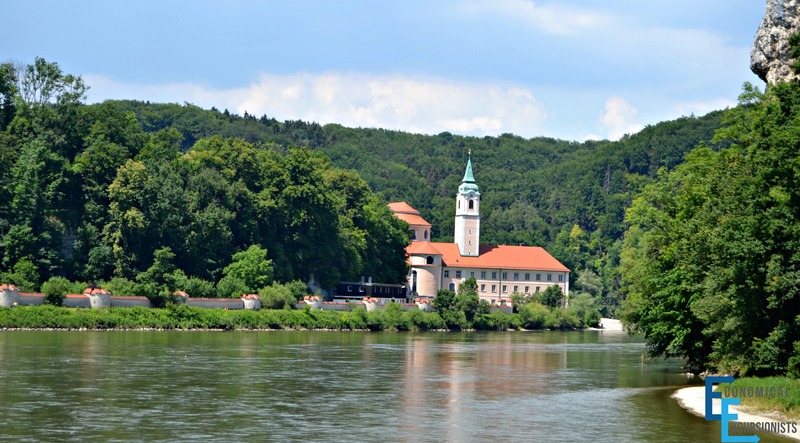 However, when we head to Kelheim, it is just a means to our end: hopping on a ferry boat that meanders lazily down the Danube River (also known as the Donau) to the oldest monastery (and arguably the oldest Monastic Brewery), the Weltenburg Kloster. 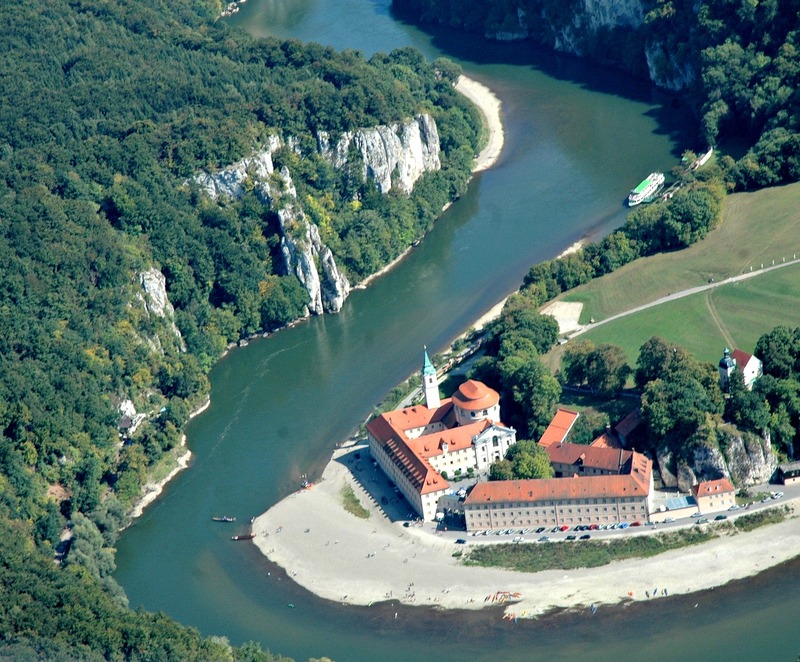 Taking a boat ride down the Donau to the Weltenburg Kloster can be a day event in and of itself. Even though the ride to the monastary is only about 40 minutes, it is one of the most scenic and beautiful river rides you’ll probably ever go on. Steep cliffs topped with green shrubs and plants poking and growing out of every little crevasse tower over the banks of the river. Every turn of the river brings another stunning view into sight. Sit back and just enjoy the scenery with a beer, cappucino or snack from the bar on board and listen to the audio over the loudspeakers (in both German and English) as you learn about the history of the area, river and upcoming Abbey. The boat ride drops you off right at the monastery in a picture- perfect location where the river winds around the kloster, creating a postcard view. Tip: As you hop off the boat, take note of the boat schedule departing the Monastery. There are several things to do to peacefully pass your time at the Monastery. The Baroque styled church is an art-piece in and of itself. You can often wander in on a service, an organ concert or just take a few minutes of silence to admire the beauty of the building. The grounds of the the Abbey are stunning as well. Set among the Arzberg “Mountain” (mountain may be quite generous of a term), a path winds through the rolling hills that takes you on the Stations of the Cross. Even if you aren’t religious, the walk is peaceful, beautiful and still completely worth it. After all that praying and walking, you are probably ready for a good cold brew. There are tours of the brewery, however, all will be in German. Granted, the art of beer making, something fun to listen and learn about, is pretty basic and so the tour can still be enjoyed even if you don’t speak the local language. Why is it that monks always seem to make the best beer? No, seriously. Most of my favorite beers have always been from monasteries! I guess when you don’t have much to do besides prayin’ you have plenty of time on your hands to become brew-meisters? But Weltenburg takes the cake (er, beer). The Dunkle (dark) beer has won the World Beer Cup Award (how do I get to be a judge at that??) not once, not twice, but three times. I’m no beer snob, but I think it’s pretty tasty myself! 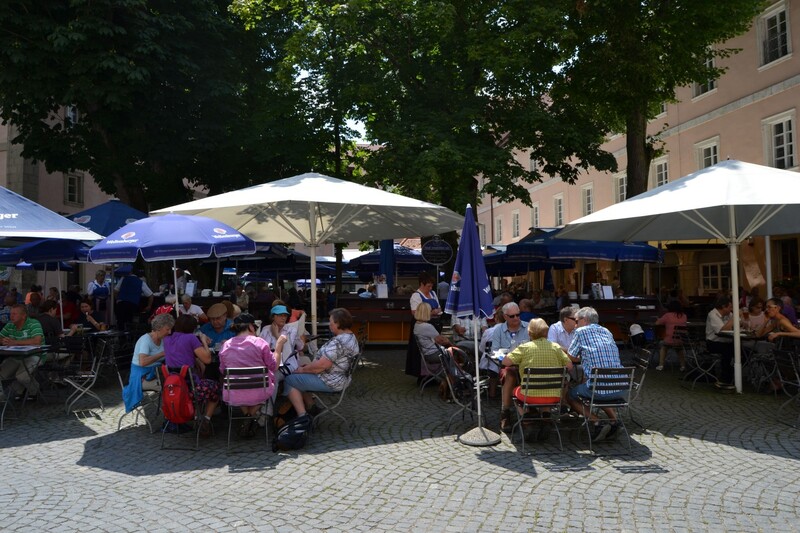 A trip to the Abbey is, therefore, not complete without sitting under the shaded biergarden, enjoying a few mugs of freshly brewed beers and sampling some truly German meals that you won’t find along the tourist routes. A few of my favorites: The Dunkle Radler, a Weltenburg specialty (Dark beer mixed with Sprite. Sounds strange. Tastes magnificent on a warm day!). Maultaschen (think German styled raviolis) and Rahmschwammerl (bread dumpling smothered in creamy mushroom sauce that makes you want to lick the bowl to get every last bit eaten). Now that you’ve gotten closer to God, learned how to make beer, drank some of that said beer and filled up your belly, the only thing left to do at the Abbey is to kick back and relax. Young kids are often brave enough to swim in the river and adults young at heart love sitting on the banks skipping rocks. Others sunbathe with a good book while some paddle around in a kayak. 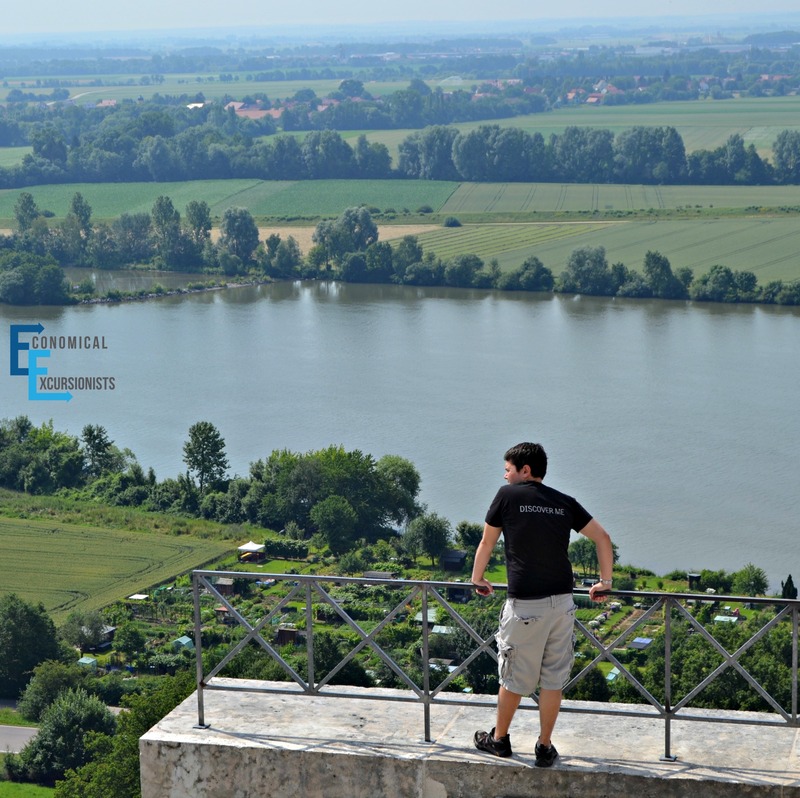 No matter your choice, take a few minutes to just soak in the scenery along the Danube River. By Car: You can easily drive to the Kloster. Be warned, depending on which way your GPS takes you, there may be a point were it tells you “And load ferry.” As we viewed the “ferry,” or, what I might like to consider more of just a flat piece of wood that crossed the river, we decided to find nearby parking and just ferry across our bodies instead of the car (I can swim…the car? Not so much). If you do this, just note the last time the ferry crosses so you aren’t stranded at the Abbey! Typically, in the summer, the boats come and go every half hour (different times for spring and fall). 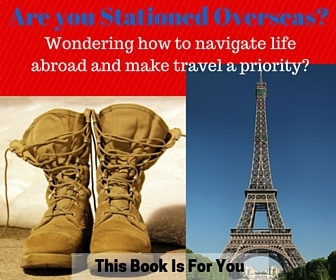 Planning a Day Down the Danube? 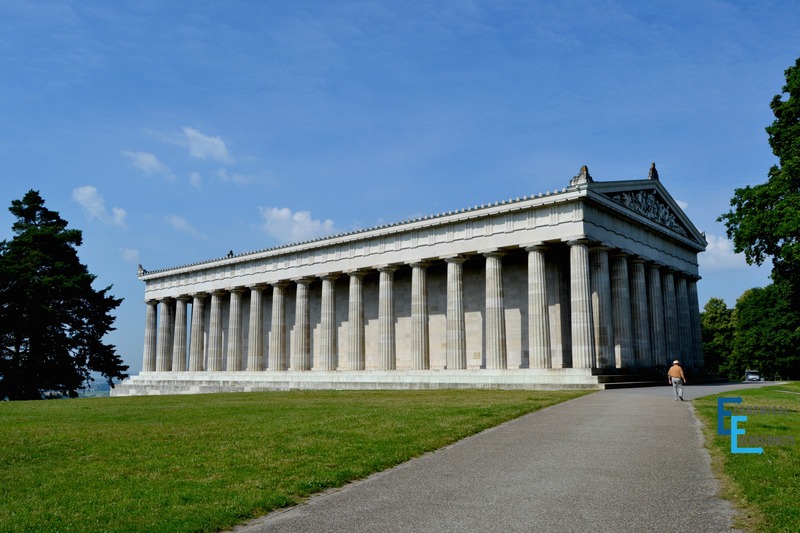 Looking like it could have been plucked straight from Greece, this memorial building sits atop a hill overlooking the Bavarian countryside and Donau river just outside of Regensburg (and 30 minutes from Weltenburg). Walking around the giant pillars, climbing the hundreds of stairs in front (358 to be exact) and just taking in the overlooking view of the Danube River is just as enjoyable (if not even more) than looking at the busts and famous figures that have influenced Germany and Bavaria on the inside of the building. Cost: To enter into the building and memorial; 4 Euro . If you just want to walk around the outside, have a picnic and simply enjoy the views, it is free. You have a few options for getting to Walhalla, and it may all depend on what you have in mind for the rest of the day. 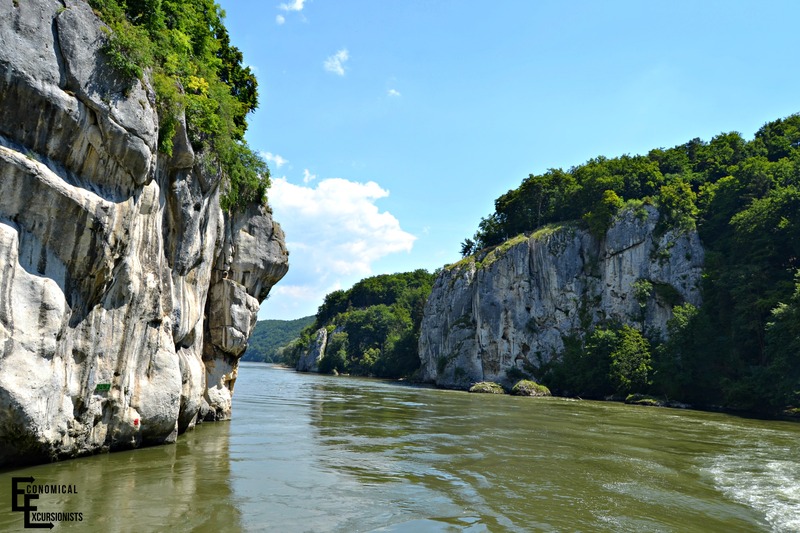 If coming from Regensburg, you can take another boat tour. Boat Tour: You can take an easy boat stroll to Walhalla from Regensburg (boarding docks next to the stone bridge and Wurstkuche). It takes about three hours including a 75 minute stop at Walhalla. Be warned that if choosing this option, it is a decent walk up a good inclined hill and remember those 358 previously mentioned steps? Yeah, you’ll be climbing those as well to get from the river to the temple. 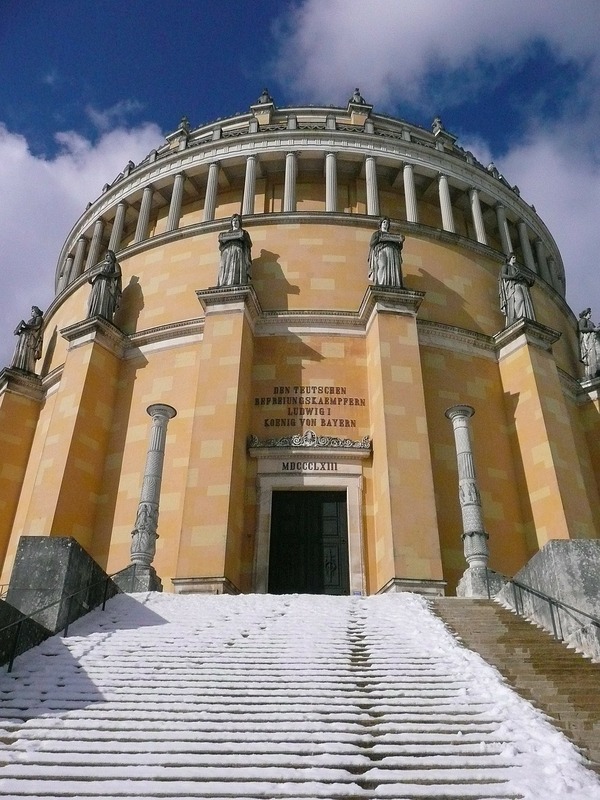 By Car: You can easily drive to Walhalla if you have a car and if combining Walhalla with Weltenburg, this is my personal preference so that you are on your own schedule. There is a large parking lot just below the memorial (just follow the Parking signs) and it only costs a few Euros to park for as long as you want. You’ll walk up a small hill (again, just follow the signs and other people) which will plop you out right at the memorial. Stroller Friendly: No. To get to the temple, you have to walk along many (easy) steps. Once at the memorial, you’ll be faced with even more if you choose to walk along the front. No matter what you choose for your day down the Donau river in beautiful Bavaria, you are sure to have an absolutely amazing day! 20 Day Trips In and Near Bavaria For Every Type of Traveler 20 Things You’ll Accidentally Do If You’ve Ever Lived in Germany Hamburg: Off the beaten tourist path Ludwigsburg Pumpkin Festival: The largest in the world! For some reason, I didn’t imagine clifftops along the Danube. How cool and what pretty scenery! We really have so much more to see in Germany! I’d love to take a boat ride down the Danube and visit the monastery. I wasn’t expecting sandy beaches or cliffs along the river either. I especially love your photograph of the monastery from above. Where were you when you took that picture? Looks beautiful. I’ve done a cruise up the Rhine and driven along the Danube. Sounds like I need to combine both. The buildings along these European Rivers are just stunning. I agree, driving is good but when you can kick back and just relax on the river, it makes it so much more enjoyable! Amazing scenery – the rugged cliffs were not what I was expecting at all! And its awesome to read about destination and towns that are lesser known – there is just so much of the world to discover! Thanks for the inspiration! I know that feeling when the weather turns nice and you feel like you’re in a paradise of sun – we get that a lot here in Seattle because it’s often gray and overcast too. The places nearby to visit there look so nice. I would love to travel on the Danube. You just gave me an idea about a great trip. I love Bavaria but have never been to Regensburg and didn’t know you can take this beautiful boat trip down the Danube from Kelheim. 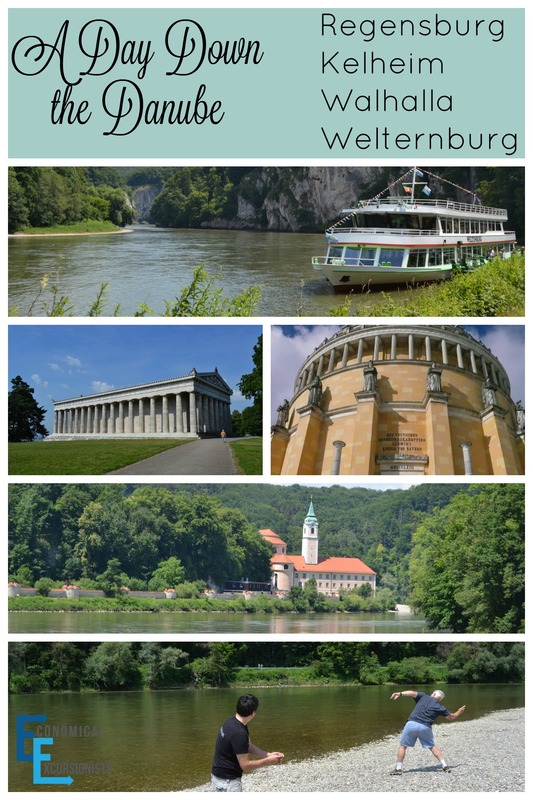 I’d love to visit Weltenburg Kloster and all the picturesque sites along the way. I loved Bavaria! I lived in Darmstadt for a few years and I made the trip over a few times. When the weather is great, the green of the landscape is amazing! Walhalla was one of the first international destinations I ever visited – way back when I was 16! – and it was really cool to see here. I still remember those amazing views! ← Day Trips: Are they even better than vacations?